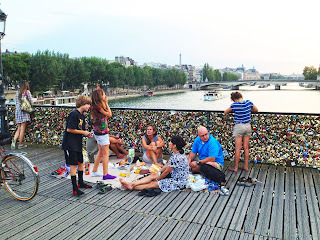 Here's a nice little run that packs-in a lot of real Parisian flair: a route from the middle of the Seine River through the creative Left Bank neighborhood of St. Germain and then on through the elegant Jardin du Luxembourg park. Along the way, it will pass such historic sites as the École des Beaux-Arts, Saint Germain des Prés church and the French Senate palace. 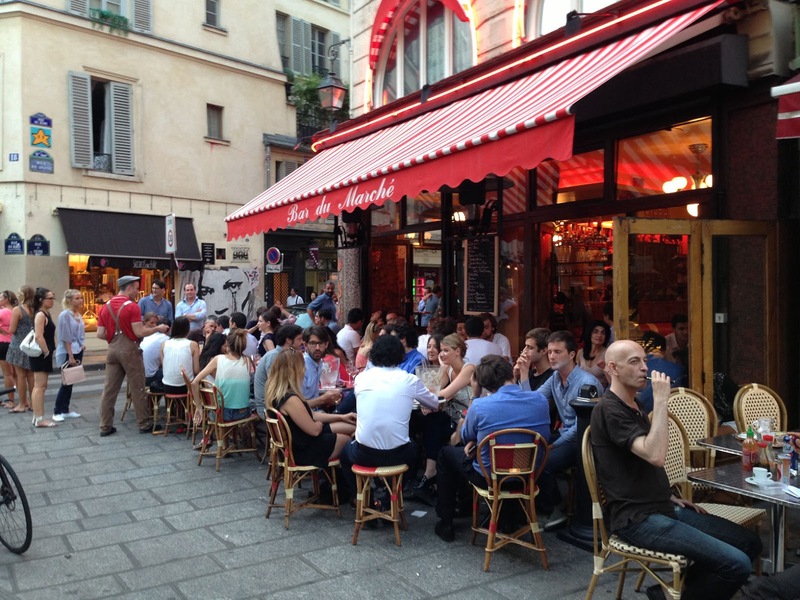 The St. Germain neighborhood is full of history, famous for its cafés, bookstores and art galleries. It's long been the home of great French designers, students, revolutionaries, musicians and free-thinkers of every sort. St. Germain was almost predestined to become the home of the existentialist philosophy movement in the 1950s. Intrigued? Then let's get going! 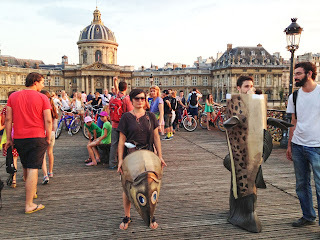 Head to the Pont des Arts footbridge across the Seine, at the Louvre. 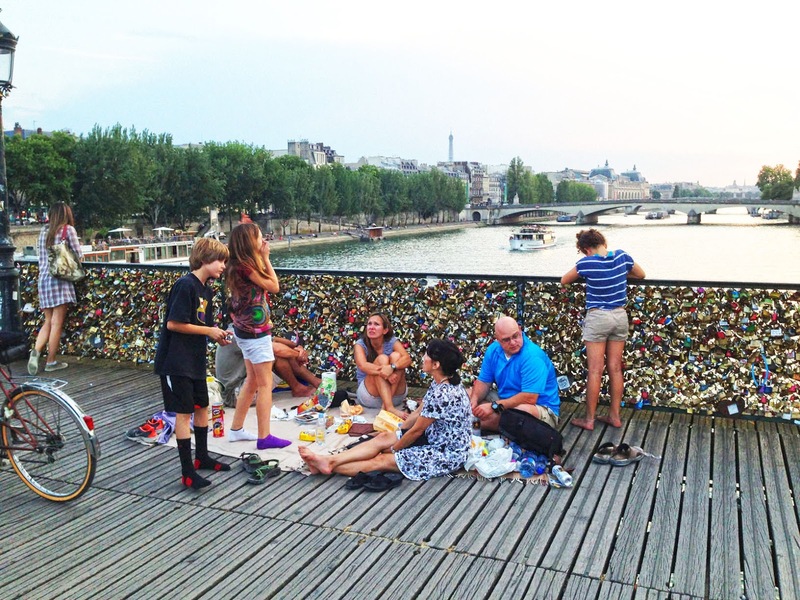 This is one of my favorite bridges anywhere: gathering place for couples and friends for a bottle of wine and a piece of cheese on nice summer evenings, with the Louvre Palace on the one bank and the domed elegance of the Institut de France on the other. But we're not here to just hang out and watch the tour boats glide beneath the bridge, so off we go! Run south across the bridge, heading towards the Institut dome, then turn right to follow the river and the green booksellers' boites for a block along the quay. Now cross the zebra stripes to the left to enter narrow Rue Bonaparte, heading south again. The galleries begin immediately, with amazing objects which you would you can hardly imagine that such things really exist. Every cross-street around here is full of even more galleries, a collection that no other city in the world can offer. After a block, you'll pass the École des Beaux-Arts, the French national school of design. The lucky students who get to study design around here! In another two blocks, you'll cross Rue Jacob, and down that street on the right the Treaty of Paris was signed between the US and Britain, ending the American War of Independence. Benjamin Franklin led the American delegation. NOTE: And down Rue Jacob in the other direction, there's one of my favorite Parisian hotels, Hôtel des Marronniers, set off the street on its own courtyard, with a beautiful breakfast terrace out back. After another block, you'll come to the church of Saint Germain des Prés, what's left of a once-important monastery. It was closed during the French Revolution and was then partly used as a prison, where a massacre of the prisoners was carried out when counter-revolutionary armies approached Paris. The church is beautiful, and maybe you'll get lucky and be able to visit it for a concert some evening. 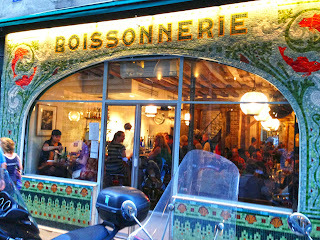 Now cross the busy street Boulevard Saint Germain and keep running south along Rue Bonaparte. In a couple more blocks, at the one-kilometer mark, you'll see the huge, strangely unfinished church of St. Sulpice. The bell tower to the right side was never finished: work stopped when the tower threatened to collapse. NOTE: By the way, this church played a role in Dan Brown's thriller, The Da Vinci Code, where a nun is murdered by a bad-guy who was searching for a clue buried under the Rose Line running through the church floor. Continuing south from the church, Rue Bonaparte is lined by a narrow park on the left, making it even nicer. The street ends at Rue de Vaugirard, with the fence for the Jardin du Luxembourg straight ahead. Turn left and run along the fence until you find the entrance after just 30 meters. Now run into the park, continuing southwards through the trees, past the chess-players and the playgrounds and the mini Statue of Liberty. There are oases of quiet towards the back side. While other Parisian parks, like Tuileries, are totally overrun by tourists, this one is still full of locals. How refreshing! When you get to the back end of the park, keep to the left to exit at the main south gates, at the two-kilometer mark. You are now running south through a green, narrow square, the Jardin des Grands Explorateurs, flanked by some old university buildings. Run the two blocks until the square ends, rounding the fountains with their wild copper horses and return to Luxembourg Garden along the other side, re-entering the south gates. Run straight towards the Palais du Luxumbourg ahead, home of the French Senate. Keep along the right side, and enjoy all the people relaxing in this amazingly elegant setting, passing the three-kilometer mark. You'll pass another quiet oasis on the right side, the Fontaine Medicis. The 350-year-old palace and gardens was built by Marie Medicis, mother of King Louis XIII. Now exit the park next to the palace and turn left and run towards the Sénat entrance and the police watch, and then turn right to head up Rue de Tournon. This fairly residential neighborhood is typical Saint Germain, upscale but creative, with a lot of nice local shops and a covered market to the left in a couple of blocks. The street name changes to Rue de Seine and you'll cross busy Boulevard Saint-Germain again. 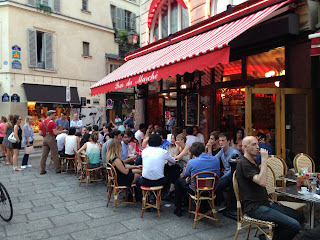 In a block, you'll cross Rue de Buci, a street of door-to-door restaurants full of tourists, but a fun place nevertheless. 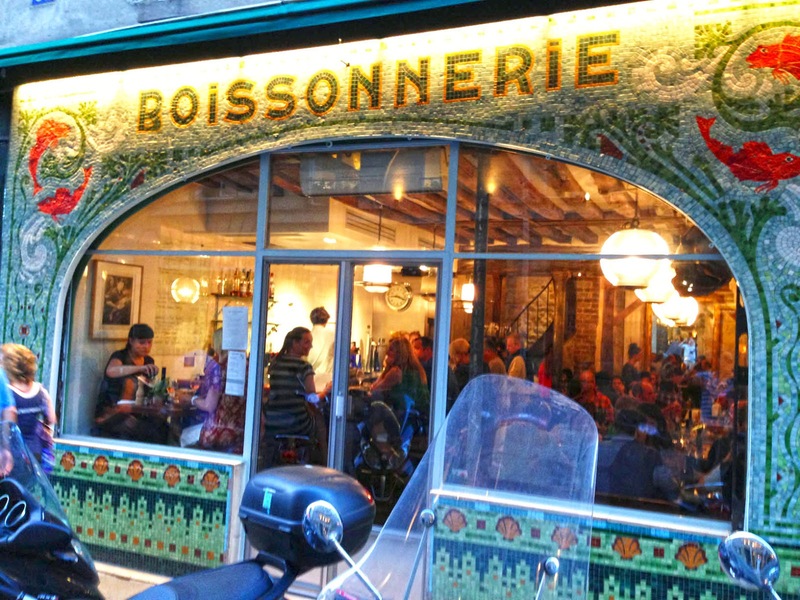 Run past the wonderful mosaic facade of the Boissonnerie fish restaurant and you'll find yourself back in the heart of the galleries again, with each gallery window more amazing than the last. In a few blocks, you'll be back at the Institut de France, and just a few steps away from the Pont des Arts finish. Ah, Paris!